Your destination is not listed? 1. Fill In The Instant Booking Form. 2. Insert The Transfer Details. Airport Transfer pick up will be instantly updated if your flight is delayed. Experienced Drivers Will Welcome You And Drive You To Your Desired Destination. Hot deal 25 % off on Airport Taxi Transfers in Split Airport. Why book transfer with us? Great deal for Airport Transfers, book transfer in advance 24/7. Taxi, minibuses and coaches are available. Special offer for Split airport transfers. Book airport transfer in advance with Voxtransfer.com and pay upon arrival to the driver. Book your airport transfer now to get the best prices for taxi transfers. Booking airport transfer with Voxtransfer.com is fast & easy and you will receive instant voucher for your bookings. Save yourself time and money by booking in advance airport transfer with us. English speaking driver will be waiting for you at the arrival gate of the airport with a notice board with your name. Flights are monitored for delays and pick up will be instantly updated to the arrival time of your flight. You will get a transfer on a time. Voxtransfer.com has a large selection of vehicle types - taxi, minivans, minibuses, coaches and limousines. All vehicles are air conditoned, fully licensed and kept clean both inside & outside. You can make changes or cancellation to your airport transfer reservation using the log in details contained on your booking voucher. There is no charges for making changes or cancellations to your airport transfer bookings. Voxtransfer.com receive constant repeat airport transfer bookings from satisfied customers which is the result of Voxtransfer.com high customer satisfaction standards. 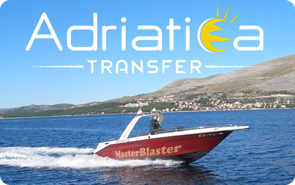 Voxtransfer.com provides airport transfer service between Split Airport and destinations in Croatia. Split Airport is second most important airport in Croatia after Zagreb Airport. It is also known as Resnik Airport. The city of Split is a city in Dalmatia, Croatia. Local people have a few nicknames for Split: The most beaufiful city in the world and Mediterranean flower. Book in advance cheap taxi transfers from and to Split Airport, 25% OFF for airport transfers. Why not book your Split Airport transfer with us now! Transfer from Split Airport to Vodice, Transfer from Split Airport to Sibenik, Transfer from Split Airport to Brodarica, Transfer from Split Airport to Rogoznica, Transfer from Split Airport to Marina, Transfer from Split Airport to Primosten, Transfer from Split Airport to Split, Transfer from Split Airport to Makarska, Transfer from Split Airport to Tucepi, Transfer from Split Airport to Brela, Transfer from Split Airport to Trogir, Transfer from Split Airport to Brac, island of Brac, Transfer from Split Airport to Hvar, island of Hvar, Transfer from Split Airport to Novalja, island of Novalja. Copyright © 2012. VOX transfer. All right reserved. developed by Nove vibracije d.o.o.